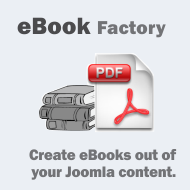 eBook Factory is an automated Joomla Extension that allows you to create PDF structured like an eBook, PDF Catalogues, PDF Directories using your website content. Most websites have valuable and unique content that webmasters share with their subscribers. In our hasty world users do not always click on links in newsletters, so many webmasters include a preview of the content or a PDF with the main articles in it. The PDF can contain active links that lead users to the targeted sites or to content items in your site, and can be read online and offline. eBook Factory provides the structure of an eBook to your PDF, including the cover (image or HTML), introduction, index, acknowledgements, copyright and table of contents (with page numbers). All eBook Factory features can be accessed from Administrator backend. You can see some sample ebooks in the module on the left, or you can log into the admin backend and test yourself some ebooks and settings. Your articles become Chapters in your eBook, featuring multi columnar display and including pictures and hyperlinks. Settable from eBook properties are font styles and sizes. Chapter headers and page number font can be set separately. Page formats can be choosen from “Common” sizes like “A4”,”Letter”,”A5”, etc. or can be customized. Metric and English measuring System can be used. The Cover image can be uploaded for each eBook individual allowing you to create individual adapted books! PDF locking is also available – a way to protect your PDF from being altered by a third party. Say for instance you want to create an electronic Catalogue out of your products in your Virtuemart eCommerce shop. All you have to do is add Categories or individual Items into an eBook and by rendering all products in that category will be pulled in your catalogue. You can fully control the way your catalogue looks by editing the templates handling the Virtuemart plugin. These are simple HTML files that can be edited without any PHP knowledge whatsoever.